I receive dozens of inquiries every week about assessing antique American Flags. Please read these pages over carefully; you may be able to assess your flag yourself. If you wish a professional written assessment or appraisal, please link to the Antique Flag Assessment Service page. PLEASE DO NOT CALL or EMAIL ME ASKING FOR THE VALUE OF YOUR FLAG. Value is a factor of design, age, scarcity, size, condition, quality, provenance, and known market activity. All of these factors must be analyzed before any value determination can be attempted. 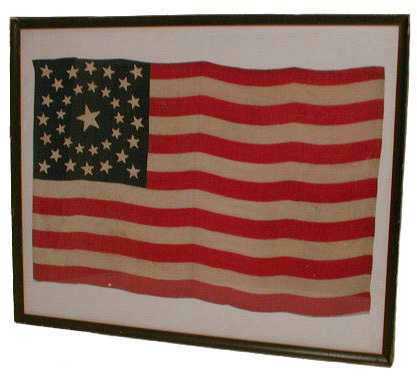 If you seek a value, read the Antique Flag Assessment and Appraisal Service page. Thank you. ALSO, I DO NOT SELL ANTIQUE FLAGS. Contact dealers such as Jeff Bridgman American Antiques. Please tell them I sent you.